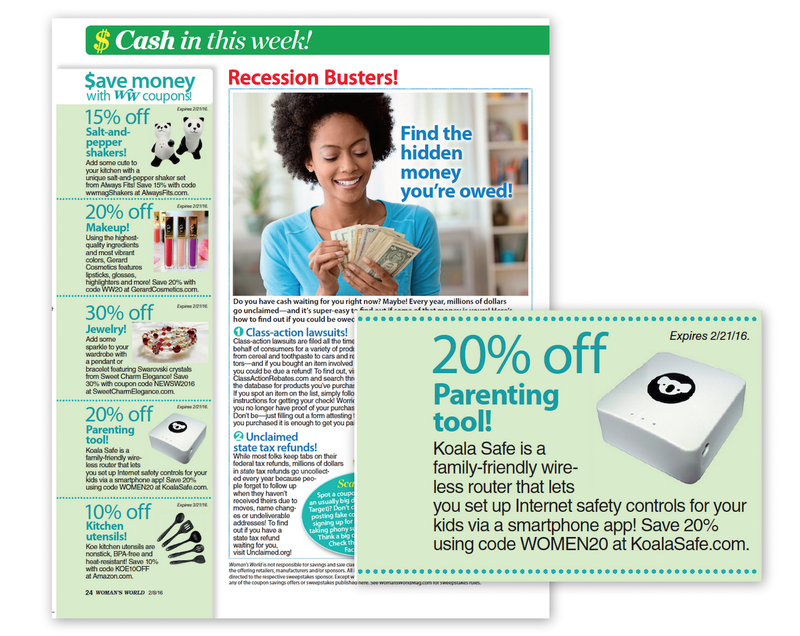 Congratulations to our Client KoalaSafe for their feature in Woman’s World! With more than 30 percent of U.S. children playing with mobile devices while still in diapers, according to childrenâ€™s advocacy group Common Sense Media, itâ€™s even more critical to give kids time offline by disconnecting their devices automatically. KoalaSafe is here to help parents restore the online balance in their homes in todayâ€™s digital world. With a single KoalaSafe box, parents can protect and manage all their childrenâ€™s devices from a mobile device interface. The KoalaSafe wireless network can be set to turn off at directed times so kids canâ€™t access the Internet â€” saving parents from the bribes, fights or tantrums of having devices taken away! Check them out at koalasafe.com!